Do you work for Internet Explorer? Learning about Internet Explorer? We can help. "Internet Explorer - Where everything started"
Internet Explorer is the very first browser that you will use upon installing any Windows operating system, aside from Windows 10 that uses Edge but still Internet Explorer is available. Internet Explorer uses less resource compared to Google Chrome and Mozilla Firefox. It also has a basic functionality which is very useful for those that are not really familiar with internet browsers. Internet Explorer also has add-ins that help users with browsing. It can also translate webpages to your native language. Internet Explorer can also be integrated with your anti-virus software for a more secured browsing activities. The only thing that I dislike about Internet Explorer is that it requires some add-ins for basic browsing tasks such as audio playback and video streaming. Unlike Chrome, Internet Explorer still needs to download and install either Microsoft Silverlight or Adobe Flash Player in order to play videos or audios. There are also webpages that might not be compatible with Internet Explorer. Either you will not be able to access the website or the website's interface might look different when viewed on the Internet Explorer. I don't have to recommend Internet Explorer to anyone because I know that everyone will use it on their daily browsing needs. To be honest, there no problems that need Internet Explorer to solve. 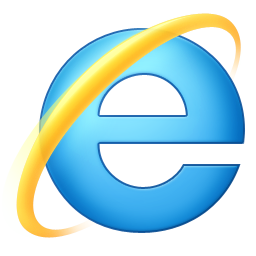 Internet Explorer is the very basic browser and it can really help you with internet browsing from day one. "Internet Then & Now 2018 "
The internet being the "go to" for almost all or most of my and my colleges source for information. Families of all ages ranging from 2- late 80 … opposed to ages "then" in the early part of the 1980's ages where about mid- 20's to older..."now" about the age of 2 can look at videos , play games, and be on facebook and other social media sites... Times HAVE truly changed in technology obviously and internet uses have changed also including "age wise". The ads that are inappropriate or any scams type sites that pop up or advertise... How easily children that use the internet can be mislead and/or with the type of one letter or button end up on harmful or very inappropriate websites even innocently browsing also. People that aren't familiar with internet usage can easily be influenced/or worse because of how some website can trick people. Questions that guests need answered right away or that the web has the answer too and we can help them.The major benefit is its quick to access web for information. New or updated programs we use at the Hotel grant us trained employees the best in access to guest relationship problem solving and knowledge. "I do not enjoy using Internet Explorer"
There aren't many positive things I have to say about Internet Explorer. As a Microsoft product, it supposedly integrates well with our Microsoft Dynamics CRM system. However, I find that I experience less software bugs when using Google Chrome. Internet explorer is slower and buggier than other internet browsers I have used. I switched to Google Chrome a long time ago and I have not looked back. Forget it. Use Google Chrome instead. Again, I only use Internet Explorer for testing purposes, like if i need to see if I'm experiencing an issue in multiple different internet browsers. The only thing I use Internet Explorer for currently, is checking to see if I experience issues in multiple browsers. So only for testing purposes. Internet Explorer has always been a great browser, mostly because it seems to always have the tools to easily run a variety of different things online. It seems like whenever I use Chrome and or Safari, sometimes they have issues with certain files. In particular, I work with FTP sites that work only with Explorer. Also, the Internet Options in Explorer work great when changing settings. For instance, yesterday I couldn't get my Outlook emails to open in Chrome, even after making Chrome my default browser. I decided to make Explorer my browser, and everything worked perfectly. When it comes to stability and ease of use, Explorer is tough to beat. I feel like the physical appearance of Explorer could use an update. I feel like Chrome looks more appealing to the eye, and Explorer always has felt slightly outdated with their menu systems. If Explorer added more of a clean look with more white space and new icons, I think more people would be inclined to use it over browsers like Chrome. Explorer is probably the most reliable browser when it comes to working with data and FTP sites. Our company uses a lot of automotive dealer portals and FTP sites that always have restrictions that don't work with Chrome and Safari. Explorer basically solves all of these problems. Explorer is my go to for FTP sites here at work. A lot of times I have to work with data files and spreadsheets than simply will not work with anything besides Internet Explorer, so without it, I would be in big trouble. A know everybody has a preference on their browser, and I have used everything from Firefox, Safari, Chrome, to Explorer. When it comes to reliability in the workplace, I would highly recommend Internet Explorer over the other browsers. Let me start off by saying that I have been a regular user of Internet Explorer for as many years as I can remember. I like best that it is reliable - I experience way fewer crashes when using Internet Explorer than I do with similar internet browsers. Also, I like that Internet Explorer is quick to load the web pages. This is very important - especially in a time like this when so many people spend so much money on fast internet speeds, if you have an internet browser that is slow, it defeats the purpose. Bottom line, when Internet Explorer works and is compatible with a web page, it is the fastest and best internet browser that there is. I dislike that Internet Explorer isn't compatible with all internet websites! It is so frustrating when you are doing something in Internet Explorer and then go to checkout or save what you are working on and it won't allow you to click the button and proceed - or even worse, it crashes and you lose everything you are working on. Also, I don't like that Internet Explorer isn't compatible with MAC or Android devices, unlike some similar internet browsers that are compatible with several or all operating systems! In this age, people are using so many different devices to browse the internet - since Internet Explorer is only compatible with the Windows operating system, it really limits how much I use this product. I recommend Internet Explorer if you are looking for a fast internet browser. While Internet Explorer is not compatible with all web sites, I have found that it is usually compatible with more web sites than the other leading internet browsers. Therefor, Internet Explorer is always my first recommendation for an internet browser. I also recommend Internet Explorer because of its security. I have found it to have the best pop-up blocker - so, if you like to watch movies or things like that on your internet browser, I recommend Internet Explorer since its pop-up blocker will save you from viruses and adware. Internet Explorer is a huge benefit to our company simply because of its speed in loading web pages. In an era like today when so much work is done via the internet, it is almost necessary to have a fast web browser in order to be efficient. The last thing you want to do is be in a time crunch, in the middle of working on something important and be stuck waiting forever for your internet browser to load a web page. Internet Explorer's superior speed has proven to be a huge benefit and time saver to our everyday work. "Not as good a Chrome"
I like that it is user friendly and very clickable. It integrates well with Outlook, MS Office Online, OneDrive, and even Skype. Surprisingly, I like it MUCH better than it's new replacement "Edge." It does seem to do well with basic website and it is very user friendly/clickable. I hate Bing! Oh, how I loathe that search engine. Also, it tends to have random updates which suddenly don't work with certain website features. For example, we use WECM website which has a dynamic table on the homepage which will not display with IE. It is frustrating because, if you are unfamiliar with the website in the first place, you won't even know if you're missing something. If you are familiar, then you don't know if it's a website issue or an IE issue. I would honestly suggest using Chrome until IE can figure out how to handle the updates in conjunction with website loading and dynamic web content/features. I'd also highly suggest -if you must use IE- to change the default search engine from Bing to Google. You won't regret it!! Currently, we are actually instructing our staff to use Chrome instead of IE due to the issues with the most recent update which causes websites to either crash or hang. "Internet Explorer is a fast and easy way to surf the web." Internet Explorer had a wide range of tools that they offer to their users. Some of these tools include; smart screen filter and pop-up blocker. The pop-up blocker is useful when you have cookies enabled and don't want to be bothered by other products popping up on your screen while trying to do some work. With Internet Explorer, sometimes the user is unable to print full screen documents on their printer. The aspect ratio when printing pictures fails and the pictures come out pixelated. My recommendations to others prior to using Internet Explorer are that Internet Explorer has many compatibility setting that allow the user to navigate on virtually any page without disruption of content. Internet Explorer also has many add-on features that allow you to enable and disable any and all add-ons. My favorite are: Adblock, evernote, and blur. These three add-ons allow a safer navigation and dictation for whatever browsing you'll be doing on the internet. Lastly, Internet Explorer is an essential browsing platform that introduces the user to a wide range of news, search engines, media, sharing platforms, and almost anything that you need. Surfing the web is the fastest and easiest way to obtain information, read emails, and educate yourself on news topics. Simply, the problem that I am solving is when I need answers, I rely on Internet Explorer to link me to the web and different search engines like google and yahoo. The benefits of using Internet Explorer is that it work on all different types of computers and operating systems. The appearance is what I like best in Internet Explorer. Compared to its competitors, M.E has vast improvements to make to be able to compete with Chrome and FireFox. I do not use Explorer on a daily basis due to its ease of use and speed. "Essential for some of our systems." Is universal, is installed on all of our PCs by default. Universally well-known and installed. IE is obviously very universally installed, but does lack functionality compared to other browsers. we have an additional, more recent browser installed on each device, and will launch apps via a command line parameter to ensure that they open in the browser we need them to. A lot of the systems that we have to use have been hard-coded to run on IE. As a health care organisation, it's essential for our patient care that we're able to to use these applications. There is absolutely nothing I like about this product. How Microsoft forces you to use this product when you buy a new computer. I wouldn't recommend this product to anyone. I am forced to use it in order to use inner software to perform my job duties. I'd rather use anything other than Internet Explorer. None because I prefer to use Google Chrome or Firefox. Longest history of explorer. Most common and everyone is used to it. Can't do much on it. Unlike other software, it has no plugin or other software that can link to it. Company internal website, ADP, daily browsing. Fast and commonly used. It is compatible with certain programs that my hospital uses (where Google Chrome is not yet compatible). It crashes and freezes a lot! It is also obviously slower than Chrome. I don't really "recommend" Internet Explorer if you're just looking around for a browser. I have to use it daily only because it is the default at my work and Chrome is not compatible with some programs I must use. Should IE improve its speed and fix its frequent crashing problem, I would start considering recommending it then. I use it daily to run programs for viewing patient documents and internal reports on issues. "still one of the best browser"
its not really fast as compared to some of the new browsers. "Microsoft internet explorer aka EDGE"
It is very important to know that Internet Explorer is available for free , It has reached all the nations with internet connectivity , It is also present by default with any version of Windows operating system , Some sites can only be opened specifically for IE and now Internet Explorer is still the most widely used browser worldwide . There are limited options for customization in Internet Explorer , Compared to Google Chrome and Mozilla Firefox .Users may face an issue regarding the speed of Internet Explorer.Alternating various features of Internet Explorer through plugins and extensions are not that possible with internet Explorer. I like Internet Explorer because it has ALWAYS been around. Everyone says Chrome is better, but it is just such a habit to use Internet Explorer. It is easy to use and I know my way around it. It's the OG of internet browsers. There is not anything specific that I dislike about Internet Explorer so I do not really have anything negative to say. I do not for say "solve business problems." Have not really noticed any new benefits to Internet Explorer. Everything appears to all be there like it was before - Just with a new twist. "Best application for internet browsing." 1).It is very easy to use. 2).It allows to browse internet very steadily with less cookies. 1).Sometimes it gives a lot of pop-ups which becomes very annoying at points. 2).It takes time to load the page. In my project i am using internet explorer for most of the web application automation. I like everything about internet explorer it's not a slow browser it's always doing updates so it always is ahead. I use internet explorer for all my business needs it's very helpful especially if you are running your own business it keeps me looking professional. This browser comes preinstalled on every windows machine. That is the best thing I can say about it. I solved my browsing issue by using this browser to install chrome. I like the easy access on any computer that you might use. Explorer freezes up is very slow. The adblocker is not effective. Not really the best or fastest resource that you can use. I wouldn't recommend it. There is very little that I do on explorer any more. I love Internet Explorer because it's fast and easy to use. The search engine is easy. I never have any issues. Most of the programs I use for work are compatible with Internet Explorer. There is nothing I dislike about this. It is great and there is nothing I would change. Just keep improving. You always come up with ideas that blow my mind. Internet Explorer is the only product that is compatible with Avidxchange. It works very well. It is easy to use browser that allows us to use any website. It is a free search engine to use and it is simple to use and learn. It may lag some searches or it will not restore tabs if it shuts down unexpected. Download speeds can vary and take longer than expected. It is simple to use but it might be slower. It allows us to run our server and bring in clients. I like the simplicity of the browser. It's compatible with basically every program you need to download to your device. In all honesty I don't dislike anything about this browser at this time. It gives me the ability of installing and updating current programs used to solve clients problems in a timely manner. "Internet Explorer has been around for ages." IE is the default Microsoft Browser which means it or its follow up Edge aren't going anywhere. It can be slow and cumbersome and is past it's prime. Look for something faster, but keep IE in your back pocket incase updates break java, etc.. in your other browsers. IE is the defacto browser, but users tend to gravitate towards Chrome or Firefox instead. "Its an oldie but goodie!" Its great for researching, phone number look up, news & weather quickly when Hurricane season is here! I use it to research products, feedback, and even recipes. Able to access our website applications only on this platform. Sometimes slow. do not like the interface as much as other browsers. Using browser to access sites that cannot be accessed using other web browsers. "Internet Explorer does what is in the name!" I like this software because its free to use and easily lets you explore the internet. I also love that they finally copied the tabs feature of other browsers making it easier to visit many websites at the same time. security has been an issue of the past, but with current windows it seems to have been addressed. Different websites work differently in different browsers, others can give you loading problems but every site has been utilized for internet explorer. "There are better alternatives than IE"
Personally I prefer other browsers e.g Chrome or Firefox, IE is slow from my point of view. There are certain websites that we use at work that only work on Internet Explorer. The product is simple and easy to follow. There are some programs we use that work better on Chrome. Additionally, some of our programs only work on old versions of Internet Explorer. Check out all of the tabs and see what your options are for use. Utilizing programs that work best with Internet Explorer and just searching the internet seamlessly. The only thing I like about this is compatibility and can be used on a PC with minimal config. Almost everything. It doesn't seem to compete with other browsers available in the market. "Same old features pushing for Bing use"
It gets the job done. It's a great backup to chrome. It's not as user-friendly. I don't like bing and it is a default browser. It's great for information gathering. "Always behind the times and requires coding workarounds"
Any PC computer I access will have this browser so I know it will exist anywhere I go. Anytime we're developing webpages for any purpose, we have to code to multiple browsers, Internet Explorer (or as we used to call it when I worked in tech support in the 1990's, "Internet EXPLODER") is a browser that constantly requires workarounds and special pieces of code to make it work - and then it still doesn't work as well as Chrome or Firefox. Use Chrome and set it as your default browser. It will give you a better overall experience, is easier on CPU resources and overall a much better product. Use IE only for testing or as a backup. We don't use IE very much in our office except when testing code because we know it will always be the last browser to receive new features and the first browser to cause issues with new websites. I like that it is free software and that is compatible with other Microsoft products, because it is made by the same company. I dislike everything about this product. It is slow. It crashed a lot. It is not intuitive. It constantly requires updates. It is just not a good product. None. My company only uses this product to launch Citrix and then we never use it again. "The browser I use to download another one"
The only thing I really like about IE is that it allows you to access the internet. It has gotten better over time, but it's still not on the same level as Chrome or Firefox. It comes as the default with Windows so it's only used either by default or a website still requires IE to be used for proper viewing. Where to really begin on this question. The main thing I don't like about IE is that even after all these years, it still feels clunky. That's taking into account that it is trying to be other browsers at this point. It also doesn't display various pages correctly without playing with settings. I personally don't use IE unless I have to. That doesn't mean it's a poor browser, but it still has a long way to go before it can take what market share it lost, back. It's taking a good step in streamlining how it looks and making it run faster overall. Internet Explorer really only solves one issue and that is that it allows you to view websites that are specifically geared towards it. Government websites are typically geared towards IE (not all, but quite a few) and this is one of the few times I am required to use it. it is the most popular browser on the market, most applications are working fine on it. Easy to manage security, cookies, passwords etc. Range of additional features it could be used with. Sometimes it can be very slow and sometimes not so easy to adjust your image if you want to print directly from the web page. Good browser even if sometimes slow, still leader on whicjh most applications are running without any issues. I am use to using IE and I've tried other browsers, but I like this one the best. It's easy to use and I would recommend it to anyone. There is nothing that I really dislike about IE. I use IE to look up information on some of our clients information that isn't in our system. The benefits that I realize is that it makes my job easier because I don't have to make as many phone calls. "Once great but seems to have been left behind"
It still works as a browser and is reliable with all the functions you would expect from ie. I am sure long term this will be rectified but it strikes me that they have tried to oppose the tide for too long and it is about time that they launched and new version more in line with where we all need it / would like to see it be. Most of the SaaS based applications I use from CRM to Marketing and BI simply do not operate at their optimum in ie, To the point where many functions simply will not operate if entered through ie. Other options also allow for more advanced collaboration options such as email and feeds. Effective with good Security and browser options but just does not work well with many leading SaaS applications. Watch for future edition as I a sure they will get it right in the end. To launch SaaS applications across the company with optimum performance and access to all features within the software. "Still using Internet Explorer but don't know for how long!" I like that most of the websites and web tools that I use work with Microsoft Internet Explorer. (I am using IE 10 on Windows 7.) I like the "Favorites" feature of Internet Explorer. I'm still using IE because a few programs I use only work with IE but that list is diminishing slowly. I do not like that I have to hunt and hunt and hunt for settings in too many places for IE. I waste too much time trying to find settings that need to be changed from time to time. It would be so much easier if all of the settings were in one place. It is confusing that there are 2 types for all new IE versions: 32-bit and 64-bit. Is that really still necessary? Also, they still need to work on the HTML5 support. If you access a lot of HTML5 sites, I'd probably recommend Google Chrome over Internet Explorer. I'm heading in that direction myself. I use browsers probably at least 5 hours a day working on various projects for eLearning and testing of eLearning, etc. and that's just at work. I probably use a browser a few more hours at home. I use browsers mostly for research and testing. Many of our older in-house applications can only be run on IE, making it a necessary evil for use. Internet Explorer is completely unsupported, buggy, and slow. As mentioned above, able to use in-house applications as a result of its existence.